Before you start trading, it is necessary to configure the Smart DOM module to suit your trading style. 1. For quick placement of orders, activate the One-Click Mode, which will enable entering orders with just one click (i.e., the system will not request a transaction confirmation). 2. In the Trading Account window, select your trading account. 3. Select the duration of orders (DAY- until the end of the trading session; GTC - until manually canceled). 4. Select the number of lots to trade. 5. If it is required to use an exit strategy when trading, select one of three exit strategies in the Strategy Settings line. *You can find information about the description and the settings of exit strategies here: Exit Strategy. 6. If you do not need the Simple Order Placing function, uncheck the box in front of this function since this option is enabled by default. All actions to send orders are executed using the left mouse button. The type of the issued order is displayed automatically depending on where (namely, above or below the market price) as well as in which column (Bid or Ask) you click the mouse. 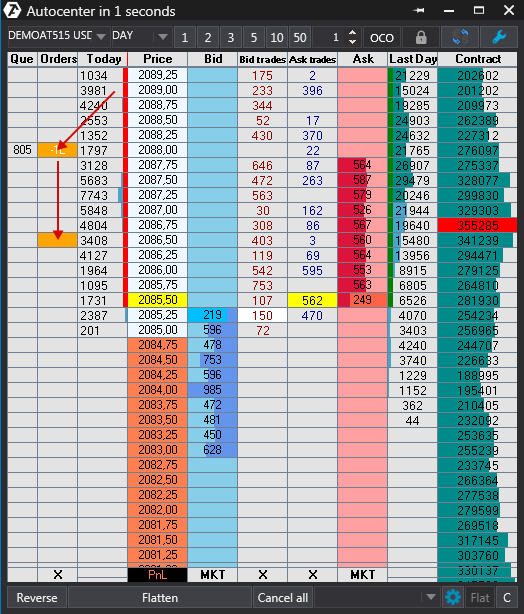 Clicking on the Bid column below the market price will place a Buy limit order. Clicking on the same column above the market price will place a Buy stop order. 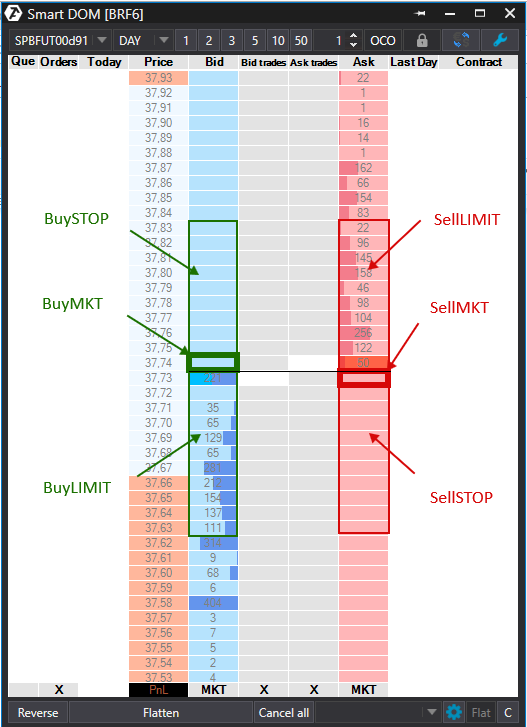 The Ask column is similar: clicking below the market price will place a Sell stop order and clicking above the market price will place a Sell limit order. Clicking on the Bid column at the BestAsk price level will place a Buy market order. If the option of auto-identification of the type of the order is disabled, both the left and the right mouse buttons can be used to issue orders. The left mouse button issues a limit order; the right mouse button issues a stop order. 1. 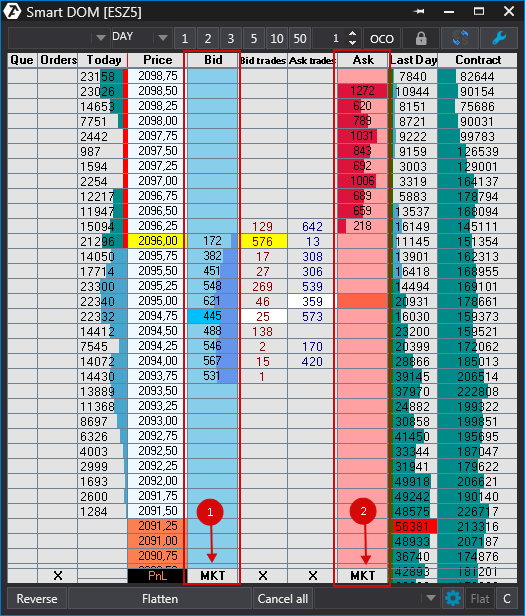 Left-clicking on the Bid column below the market price will place a Buy limit order. 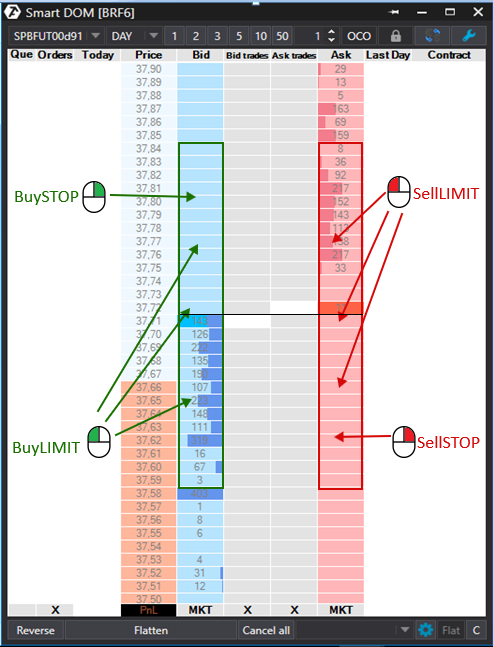 Right-clicking on the same column above the market price will place a Buy stop order. 2.The Ask column is similar: left-clicking above the market price will place a Sell limit order, and right-clicking on the same column below the market price will place a Sell stop order. 3.Left-clicking on the Bid column at any price above the market price will place a limit order that will be immediately executed as a market order (the buy position will be opened). 4.Left-clicking on the Ask column at any price below the market price will place a limit order that will be immediately executed as a market order (the sell position will be opened). 1. To send a buy market order, click the MKT button in the Bid column. 2. To send a sell market order, click the MKT buttonin the Ask column. 1. By right-clicking on the order in the DOM. 2. By clicking the Cancel All button. 3. By clicking “X” in the Orders column. 5. Using the Flatten button. 1. By sending the opposite buy or sell order. 2. By clicking the Flatten button. Reverse: this option reverses the open position at the market price. To move an order, left-click on it, which will change the order color to yellow, and then click at the correct price. * This operation applies to limit and stop orders.